Combining the best sellers, THE CALL and THE FINAL QUEST, this volume presents a symbolic account of the struggles and victories that we as Christians will eventually face. This moving narrative will encourage you to draw closer to the ultimate Victor, Jesus Christ. 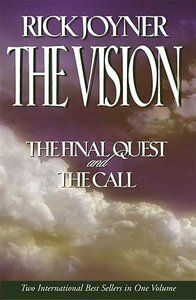 About "Vision, the 2 in 1 (Omnibus Edition)"
"The Final Quest" and "The Call" have become modern classics, selling more than a million copies. Now both books are available in this value-priced omnibus edition. ^In "The Final Quest" Rick Joyner writes about visions and prophetic experiences that unfold the last battle between light and darkness. This book is a call for all Christians to take a stand for truth and righteousness in these troubled times. ^"The Call" continues the message, offering a picture of the dawning of the day of the Lord and urging Christians to seize the opportunity to witness for Christ in the last days. ^This two-in-one book is an exhortation for Christians to live in a manner worthy of the call of God and an inspiring vision of the wonderful plans God has in store for His people. his omnibus of two bestselling prophetic classics paints a clear spiritual picture of our times. In "The Final Quest", Joyner writes about visions and prophetic experiences that unfold in the last battle between light and darkness. "The Call" continues the message, offering a picture of the dawning of the day of the Lord.